Serenbe Farms is a major component of what makes the Serenbe community so special. Where else can you walk down the road to your neighborhood farm and get certified-organic veggies, after all? Coming down to Serenbe for Saturday lunch or to shop the weekly Serenbe Farmers Market? 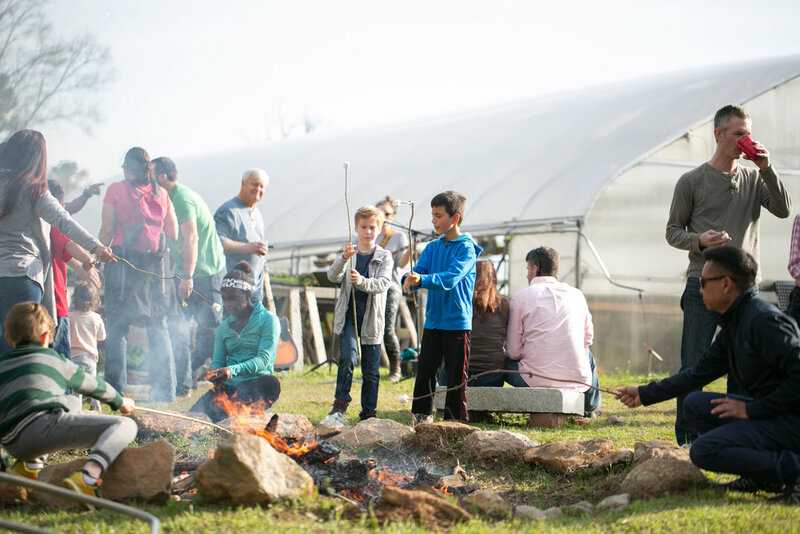 Take the whole family over to Serenbe Farms afterward to take a walking tour of the farm, led by Farm Apprentices. Every Saturday at 1:30pm, tickets are $10 (small children are free) at serenbe.com/events. There are also Sunset Beer Tours on 2 Saturdays this fall: October 13 & November 17 (just don’t bring the kids to this one!). The October tour is at 5:30pm and the November tour is at 4pm, beer will start flowing a half hour before the tour begins. Pretty cool way to spend Happy Hour, if we do say so ourselves. Tickets are $20 at serenbe.com/events. Are you a mushroom lover? Did you know that most mushrooms found in grocery stores are grown on sawdust? Take home your own REAL WOOD log and enjoy the most flavorful mushrooms you’ve ever tasted for the next 5 years! Serenbe Farms will teach you everything you need to know to grow your own mushrooms from scouting locations to harvesting, prepping and caring for your mushroom log. Classes are on Saturday October 13 & 27 and November 3 & 17 at 11:30am. Tickets, $100 at serenbe.com/events. You have enjoyed fall until you’ve spent an evening relaxing and hanging out with friends at Serenbe Farms. This year’s party will have Sweet Auburn BBQ & Gezzo Food Trucks, Creature Comforts & Three Taverns beer and live music by The Threadbare Skivvies. Kids (and kids at heart) can paint pumpkins with the Art Farm or have their faces painted, find their way out of the Sorghum Maze and play in the pumpkin patch. There will be a bonfire to roast marshmallows, and guests are welcome to BYOS’mores ingredients. Tickets are $20 at serenbe.com/events.